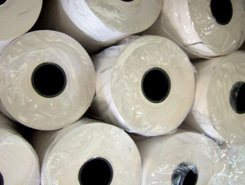 At Chesapeake Corporation, we offer a large selection of paper cleaning supplies, janitorial materials, and water cleaning products in Cambridge, MD. Between our speedy delivery and great customer service, you'll never want to shop anywhere else. Find out how our friendly team can help you today. Chesapeake Corporation in Cambridge, Maryland, is a dependable distributor of water treatment products, paper products, salt products, janitorial supplies, and much more. We always have products in stock, so you can find exactly what you're looking for whenever you need it. It is our goal to provide exceptional service, ensuring that all our customers leave satisfied. We work with you to coordinate your delivery requirements, and are happy to provide assistance throughout the buying process. When you shop with us, we guarantee that you will always receive the right supplies for your needs, including glass cleaners. Contact us to discuss your needs with a knowledgeable professional. We are proudly located in Cambridge, Massachusetts.